Obverse Walachian coat of arms - mountain eagle perched on a helmet bearing Maltese cross and headdress feathers - and mint ensign M at right (heraldic disposition). Outer pearl circle. As for the legend, see picture below. family(? ): shield split vertically; four bars inside field one, a mint ensign resembling two crossed hammers or letter chi of the Greek alphabet inside field two. Outer and inner pearl circle. As for the legend, see picture below. On the previous pages you will find a few other fakes manufactured in the same manner as this supposedly ducat from Mircea the Old of Walachia. The sides were independently created through galvanoplasty and then forced together (with real craftsmanship). Usually, this method allows for a black, separating surface between the two sides to be noticed. In this case though the edge is perfect. It was't necessary to be filed on the edge in order to hide matching imperfections, making these forgeries more harmful. 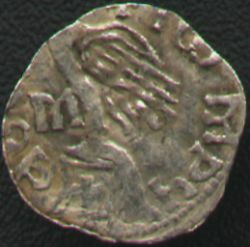 This coin silver coin was issued by Mircea the Old (cel Bătrîn), the most glorious and important of all Walachian princes. He ruled Walachia between 1386 and 1418. There are plenty of different variants in which concerns the legend, its respective fonts and the mint ensigns (usually both on the obverse and reverse, but different). Misspellings also have their share. We of course confronted the Bible of Romanian numismatics, Monede şi bancnote româneşti by George Buzdugan, Octavian Luchian and Constantin Oprescu (1976), i.e. the only book that somehow tends toward completion over Romanian numismatics and is the authority to consult. The coin seems to be the same as the one described at quote 184a, only ours is better (much better centered, more legible text). Romanian coins have been unsufficiently studied and I am not able to provide the right interpretation of the legend. Still, that is what we know for sure. On the obverse (beholder's right) we have IO MIRCEA. MIRCEA is spelled out of three letters, M, P (Slavic R) and the Slavic letter for Romanian group of sounds ce or English ch as in chart or chair. IO is a mysterious title that Romanian princes from both Moldavia and Walachia used in front of their names and complete list of titles in all their documents (written or engraved), since the formation of the respective principalities up to the Hohenzollern dinasty in the 19th century. It was always spelled with a Latin I and a Greek omega (in both Latin and Cyrillic documents). To mix things up more, IO is also a form of pronoun I in Romanian. This could not explain some Latin accounts where it was replaced by Iohannes (i.e. John in English, Ioan in Romanian). What is certain is that incipient IO, written as pointed above, is the mark of Romanian royalty exclusively. Some of the other letters of the legend fell outside the surface. Others are so badly pictured (though legible) that is risky to suppose anything at all about them. 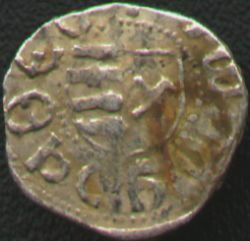 On the reverse we could distinguish clearly the beginning, IO (spelled somehow alike an I and a W) and after that maybe a stylized M.
Let us remember again that many medieval Romanian coins (issued by Moldavia and Walachia especially) are known in one or but few pieces and new types are discovered even today. It is fit in the ending to point that, with one little exception of poor quality, this and the coin on the previous page are the only two Walachian coins available on the entire net. Help from other collectors is more than needed. Do not hesitate to contact us.